St Luke's Blog: Roll up! Roll up, to the Littlewoods Funfair! Roll up! Roll up, to the Littlewoods Funfair! 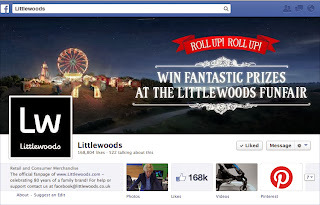 To sit alongside our current Autumn Winter TV campaign for Littlewoods, featuring Myleene Klass and Mark Wright, we have been busy creating and developing a social media campaign to encourage interaction and engagement with the Littlewoods Funfair this season. The Autumn social media campaign kicked off on October 3rd and will feature a series of Funfair themed Facebook games that employ a mixture of platforms including Twitter, Pinterest and Snapchat over the next month. The first game was Test Your Strength, which received over 1800 likes, making 3 winners. The 2nd game opens today, and you can keep up to date with all the games and have your chance to win on the Littlewoods Facebook page, and you can watch our Autumn Winter adverts here. Love all the Christmas adds this year.